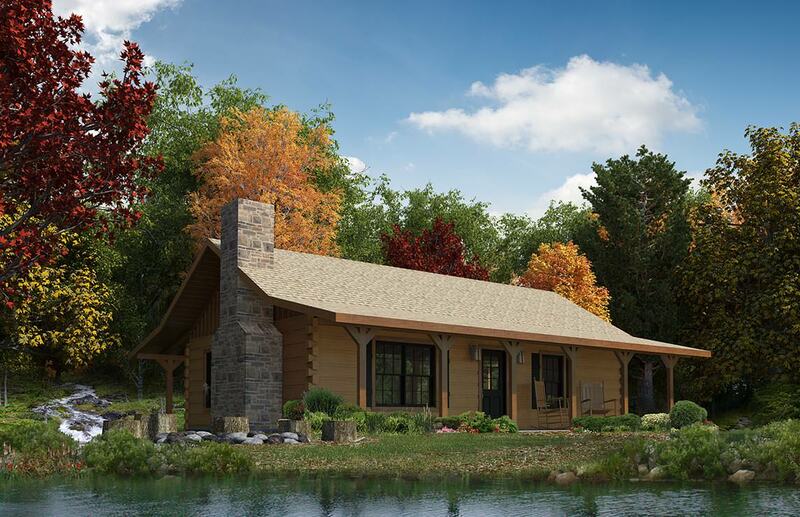 For many years, Satterwhite's Retreat log cabin floor plan has been the entry level in our catalog of homes designed to be comfortable as a primary residence, sized at 792 sq ft on a single level, something just right for many people. In addition, the Retreat has been a very popular plan as a 2nd home, a weekend getaway, a right sized log home for the family farm, lake lot, or peaceful spot in the country. Ample porch spaces on two sides make the Retreat a wonderful choice in many settings. Enjoy sunrise coffee on one side, and a glorious sunset on the other at day's end. Add a fireplace, and the Retreat delivers the full log home living experience, perfect for your favorite spot in the world. Constructed Shell price includes the full Materials Package, plus costs of construction labor and, depending on location, foundation. Materials Package consists of building materials only. Never add Constructed Shell and Materials Package prices.